I wrote about it back in July and now it’s finally here: Terms of Service: Understanding Our Role in the World of Big Data. The new “graphic novella” (Al Jazeera America‘s first graphic feature) by myself and Al Jazeera America reporter Michael Keller examines the role of big data, privacy, and the implications of sharing personal information in the—all via the “characters” of Josh and Michael. 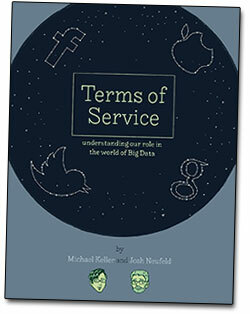 Hopefully, Terms of Service is a thought-provoking, entertaining field guide to help smart people understand how their personal—and often very private—data, is collected and used. Big Data powers the modern world. What do we gain from Big Data? What do we lose? Terms of Service look at such services as Gmail, the Progressive Snapshot program, FitBit and other activity trackers, and the not-far-in-the-future Internet of Everything. ABSORBING THE SHOCK: New products and technologies like Gmail (when it debuted back in 2004) are often shocking—Gmail scans your emails for keywords that it uses to show you ads—but then become more “normal” over time. What are the products and technologies emerging now or just around the corner that will first shock us then possibly become normalized over time? THE UNRAVELING THEORY: As evoked by by Scott Peppet, law professor at the University of Colorado, the Unraveling Theory is the idea that there’s a tipping point for adoption of even radical new products that collect and analyze our personal data. The theory goes that once enough people decide it’s okay to start revealing personal information, then those who don’t want to reveal their information are stigmatized. So, even if you’re a fine driver, if you don’t opt-in to more invasive data collection, you’ll be assumed to be a bad driver because you must be hiding something. WHO GETS TO TELL A STORY ABOUT YOU? Companies that collect and analyze your personal information construct profiles of who they think you are based on this information. More often than not, you never get to see these profiles and yet, these digital doppelgängers are determining not just what ads you see or what discounts you might be offered but whom you should date, what you should pay for auto insurance, or down the road, whether you’re approved for a loan. These profiles may accurately represent you, or maybe not. With many different profiles, as well, how can you keep control over your identity without opting out of technology all together? INTERNET OF THINGS: For the past ten years, the web has gotten very good at tracking something it knows very well—your web browsing history. As Peppet says, “Five years from now that will seem quaint because we’ll be tracking you based on all this real-world behavior,” such as your FitBit exercise data or your home thermostat data, to understand your habits. What are the issues consumers should be aware of as they unwrap these new data trackers that promise to become integral parts of their lives? The comic attempts to entertain and educate readers while providing a solid foundation for them to begin asking their own questions. Terms of Service debuted last week and has been a bit of a sensation, with coverage from Publishers Weekly, Pando Daily, Poynter, Columbia Visuals, Cartoon Movement, Digg, and much more.